Whenever I was asked about the possibility of Flash could take a picture of an IP camera and relay to Flash Media Server. Until recententemente, could not answer until I took a job that required this functionality . Flash Player only supports USB cameras. 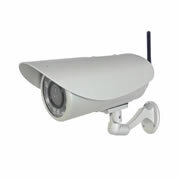 IP Cameras usually has its own embedded server is not possible to use Flash Player “inside”.